Home » Weather » 2018 Atlantic Hurricane Season at its peak; be prepared! 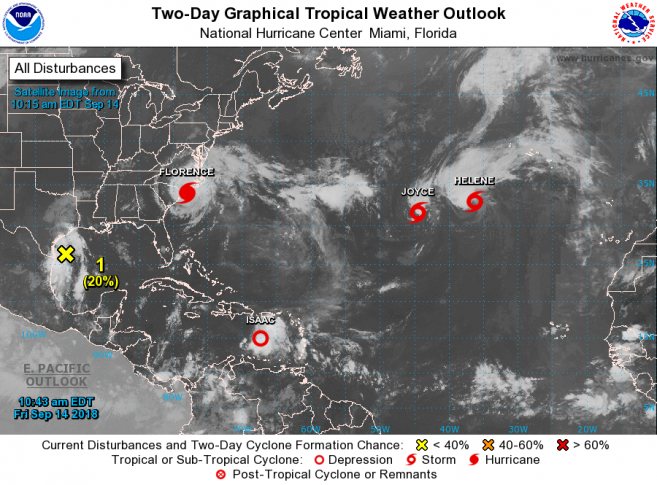 As we are at the height of the 2018 Atlantic Hurricane Season, meteorologists have been closely monitoring a very active season so far. 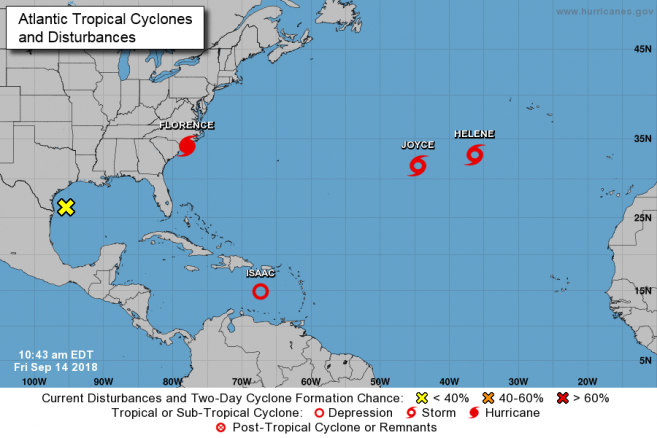 One hurricane (Florence) and three tropical storms (Isaac, Helene, and Joyce) are threatening countries in the Atlantic. Florence is a category four hurricane and is the first major cyclone of the season. On Thursday, September 13th, it began to strike east-southeast of Wilmington, North Carolina USA with strong winds of up to 105 miles an hour and storm surges of up to 13 feet high. The other tropical storm threatening nations in the Atlantic are Tropical Storm Helene, located over the eastern Atlantic Ocean, Tropical Storm Isaac, located near the Lesser Antilles and Subtropical Storm Joyce, located about 1000 miles west-southwest of the Azores. Meteorologists advise citizens to follow guidelines and be prepared during this active season. A hurricane preparedness plan entails knowing hurricane risks, knowing evacuation zones, assembling food supplies, preparing financially, strengthening your home and making an emergency plan. If you plan to stay in your home during the storm, you must ensure your doors and windows are properly locked, cut down any trees or branches that could fall or be blown into the house, and store gallons of potable water. If possible, invest in a generator for backup in case electricity is lost for long periods of time. In case of emergency evacuation, always have a kit ready with basic supplies like bottled water, non-perishable food, medicines, cash, batteries and flashlights, radio, important family documents among others. At this time no hurricane or tropical storm threatens Belize, but residents are advised to stay informed by monitoring the local radio, TV, and news. For more in-depth information on the 2018 Atlantic Hurricane Season, you can follow the National Hurricane Center on Facebook or visit their website at www.nhc.noaa.gov.